Just like we need oxygen to survive, businesses need growth to thrive. When your business stops growing, it’s time to either pronounce it dead or start implementing the best business growth hacks you can find. 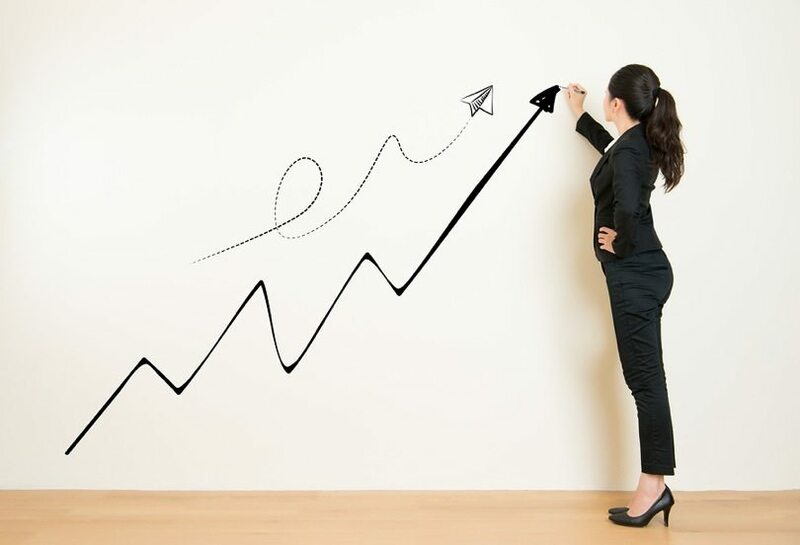 Even if you’re happy with your current performance, you should never stop looking for ways to make your business grow. As soon as you do, you put yourself at risk of allowing competitors to sneak in and steal part, if not all, of your market share. 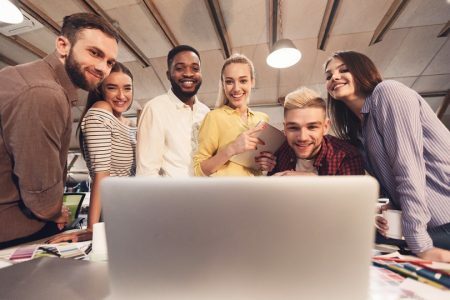 In this article, I’m going to talk about three game-changing business growth hacks that worked for my company, Wyzowl, over the last year and provide examples to show you how to implement them into your own business. I’m not going to state the obvious by telling you that the internet is flooded with content these days – everyone already knows. However, I would like to draw your attention to the fact that most of it isn’t worth your time. 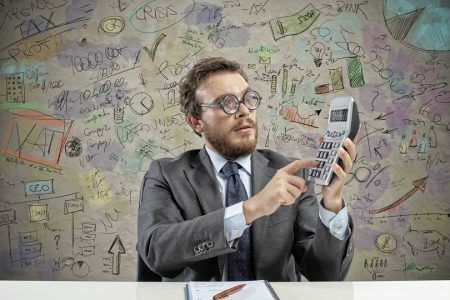 Content marketing has been around for a few years now, so if you don’t change your preferences to get the most recent content, you’ll end up watching a video from 2009 advising you that keyword stuffing is the best SEO technique out there. People don’t want to consume content from years ago so you shouldn’t link to it either. Link building is a great way to grow your business (because it signals to search engines that your website is well-liked and authoritative in your specific niche) but the content you link to should always be up-to-date. By creating your own up-to-date content, your backlinks will improve and so will your search engine rankings. But there’s more to it than that. You need to think about the type of content that people link to. Most of the time, it’s original research. In other words, a fact or figure that can’t be found anywhere else. 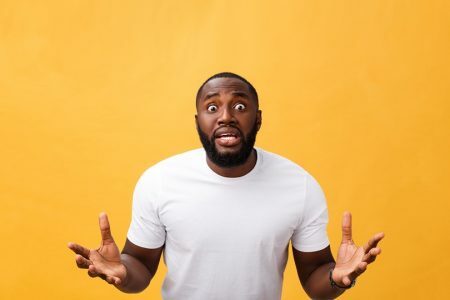 When a brand has taken the time, effort and resources to conduct a study and share its findings, it’s good content marketing etiquette to link back to their site when citing their statistics. 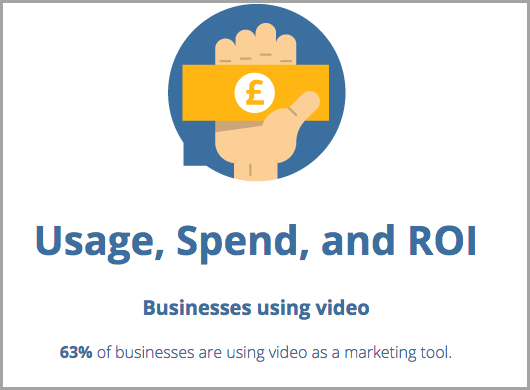 The interactive future of video – 43% of businesses plan to use interactive video in 2017. Using original research as a growth hack has been extremely effective for us, with our The State of Video Marketing 2017 survey generating 1,020 backlinks from 359 referring domains. And that’s from the last year! We’ve conducted this survey for the last three years running, and it’s resulted in 2,430 backlinks from 904 referring domains overall. Conducting original research has had a huge impact on our SEO results and has generated a ton of leads for our business. The first step towards creating original research is to take a look at what else is out there. Find topics that are relevant to your business or industry and then look for a gap in the availability of this data. For example, maybe the current available data is a little dusty, has a small sample size, or simply isn’t that comprehensive. Whatever the problem is with the existing data, find a way to capitalize and improve on it. Then follow these three simple steps to create original research. 1. Create a survey that asks questions centered around your topic. We use SurveyMonkey to create our surveys. It’s user-friendly, reasonably priced, and allows you to design your survey in line with your current branding. 2. When your survey is complete, you need to find the right respondents. That means relevant people who have an interest in your industry. 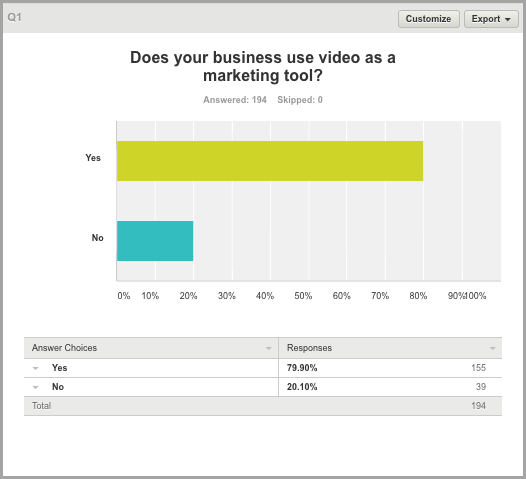 For example, if you create a survey about video marketing in small businesses, then you want the majority of your responses to be from people who work for small businesses, or people who work in video marketing, or both. To get the best results possible, you’re also going to want to aim for a minimum of 100 responses. But ideally, you’d be looking for 200-300 upwards to get a good sample size. Unfortunately, it’s not easy to find that many respondents organically. Your best bet is to use targeted ads on social media sites, like Facebook and Twitter, or buy targeted respondents directly through SurveyMonkey. But keep in mind that the more you target, the higher the cost per respondent is going to be. 3. After you have collected all of your data, it’s time to put it into an attractive format. Check out Exhibit A and Exhibit B below. I think you’ll find they provide some inspiration for how a dull-looking survey results can be transformed into something eye-catching and snazzy. To increase the impact of this growth hack, you might also want to create a dedicated page on your website solely for the original research. Then use this link every time you promote your research to boost traffic to your site. To generate leads from all of this extra traffic, create a PDF report that includes a detailed analysis of your original research and use this as an upgrade to promote to people visiting the web page. Wait! Don’t run away! I know it sounds black hat, but it’s 100% legitimate. The word ‘parasite’ may have negative connotations… but it’s definitely an apt way to describe this awesome business growth hack. Parasite SEO is the process of tapping into the potential of a highly authoritative site to rank for competitive keywords that you would struggle to rank for alone. The end goal is to funnel traffic from that site to yours. If your site is young, unknown or just doesn’t have a high authority, it can be near impossible to rank for certain keywords. The problem is, these ‘impossible’ keywords are usually the ones that people search for the most, which is why the competition is so high. High authority sites have a much better chance of ranking for these competitive keywords because they have already spent many years proving to search engines that people enjoy their content. To implement parasite SEO, you need to post content on these sites and make sure you get a backlink in return. Here’s how to implement parasite SEO in three easy steps. As you can see, the difficulty level is 76. 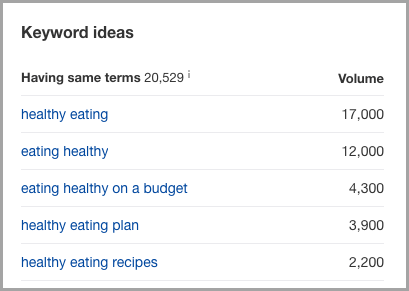 This is measured out of 100, and determines how difficult it is to rank for this keyword. So, in case you hadn’t guessed, 76 = very difficult! The great thing about Ahrefs is that it tells you how many backlinks you would need to rank in the top 10 search results for any given keyword. 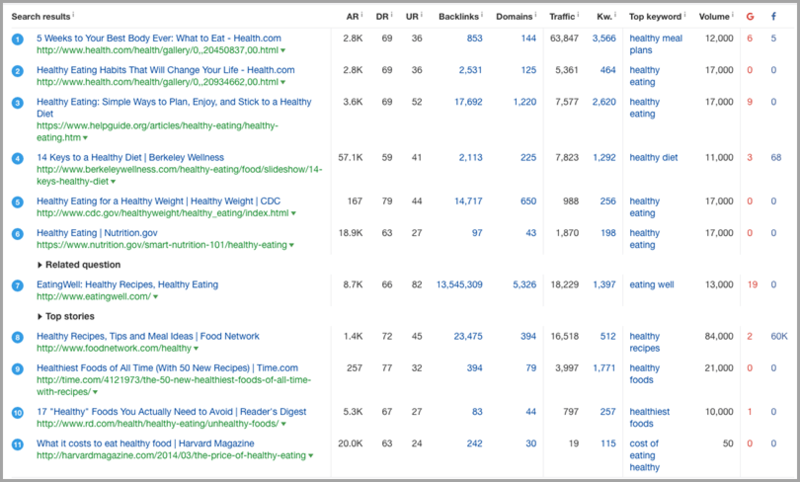 Unfortunately, to rank on the first page of Google for ‘healthy eating’, you would need backlinks from 167 websites, which isn’t realistic for small to mid-sized businesses. 2. Next, find the sites that rank for these keywords. Once you have your keywords, it’s time to find sites that rank for them. Luckily, Moz and Ahrefs can save your bacon once again! Their keyword explorer tools are super helpful. When you enter a keyword into them, they both present URLs that rank highly for it. This is basically an instant list of authoritative sites that you can contact – aka the hosts to your parasite! Of course, not all of them will be relevant, some may be competitors, and some may not accept guest posts. But it’s a start. 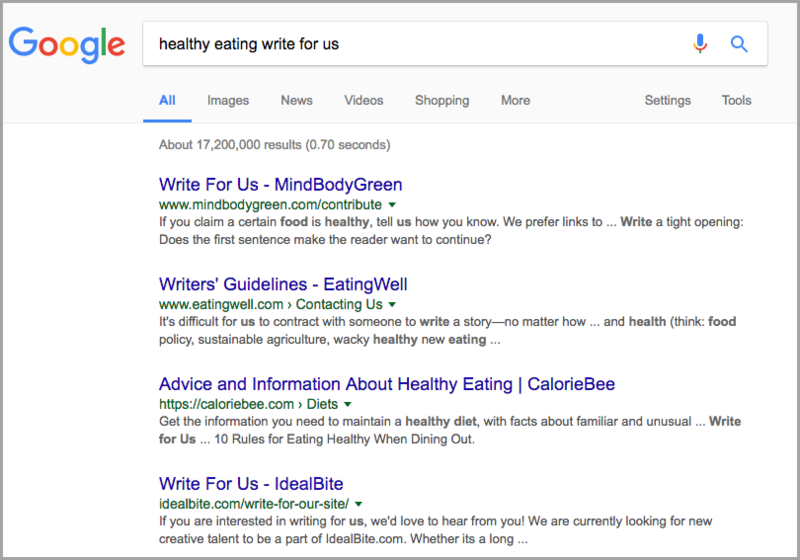 Head to Google and search for your keyword (in this case, ‘healthy eating’) alongside keywords related to guest posting, such as ‘submit guest posts’, ‘write for us’ and ‘guest articles’. 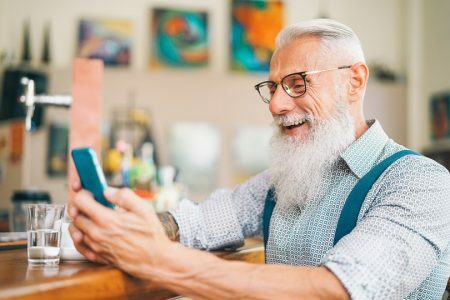 You can use the same technique on social media search menus. As with the readymade lists on Moz and Ahrefs, not all of the results you find will be perfect, but by putting the time in and creating a strong list of sites, you will reap the benefits in the long run. 3. Finally, write guest posts and link back to your site. Make sure that your posts are well-researched, interesting and shareable. When writing guest posts, it can feel disheartening to know that you’re sending traffic to a high-authority site instead of your own. But because the other site is authoritative, it means that they will rank higher for competitive keywords than yours will, and in turn, your post will get more attention. So chin up! The aim is to make it easy for people to transition from that article to your site. As well as a quality backlink, you’ll be gaining the traffic you would if you ranked highly for the keyword in the first place. Result! Parasite SEO is a long game, but the business growth you’ll receive in return is definitely worth it! As I mentioned at the beginning of this post, the internet is flooded with content. Saturated, in fact. On WordPress alone, 83.1 million new posts are published every month. We all know that rarity equals value, but with millions of new blog posts popping up every single day, the value of blogs is sinking fast. Already existing blog posts, on the other hand, can be very valuable. This showed how valuable their top 30 posts were in comparison to the thousands of others they had on their blog. With this information, the next logical step for Hubspot was to focus less on posting new articles, and more on making those top 30 posts the best they could be. In other words, they relaunched their content. Lots of brands have implemented this growth hack and seen great improvement from it, my company Wyzowl included. In order to test the hack out, we experimented by spending just five minutes on sprucing up our old content. The result was that organic traffic increased by 53%! Find out more about that here. It was an amazing discovery for us given that creating articles from scratch is very time-consuming. There’s tons of research involved, as well as the actual structuring of articles themselves and lots of painstaking cross-promotion. Relaunching content is different. There is less work involved as you’re just improving upon something that already exists. Plus, it has a built-in social proof, because the likes, comments, and shares are already there! Here’s how you can implement relaunched content in three easy steps. 1. Find under-performing content. The first step towards relaunching your old posts is to look at them with an objective eye. Head to your blog’s dashboard and find out which posts are still generating traffic. It also helps to look at posts that used to generate a lot of traffic, but have since stopped performing. What you’re looking for is basically any post with potential. Make a list of posts with potential and then move onto the second step. 2. Improve it. You guessed it! Once you have your list of posts that you are going to relaunch, you need to start improving them. You can improve your posts as little or as much as you want, but obviously the more effort you put into improving them, the more impactful your re-launch will be. Check that all links are still working. If they aren’t, replace them. Check that all stats are still relevant. If they’re over three years old, you can probably find a more up-to-date stat with a quick Google search. Update your images and screenshots. Improve your title for SEO. Check the overall structure and readability of the article. Chances are, you’ve improved as a writer since you posted it and can make some positive changes! Add some more value for the reader, if you can. In my experience, some articles will take longer to relaunch than others. You’ll also find that some articles will work better as one larger combined post than two smaller ones. 3. Go relaunch and promote like crazy. The final step is to get your article in front of the world… again! Before you do this, it’s super important that you change the publish date of your post. People only want to view the most recent content, as they quite rightly assume this will be the most relevant. If you spend hours updating an article from 2013 to make it relevant for 2017, the worst thing you can do is relaunch it under the original date! Once you have updated the publish date, you need to promote the post like it is brand new. Send it to your email list, push it hard on social media. If you think you’ve got something really special, put some paid-promotion behind it, too. After implementing this growth hack, you will see your organic traffic sky-rocket! Growing your business is a constant battle, and that’s why business growth hacks are great. By implementing the business growth hacks above, you’ll be much better equipped to grow your business in 2017 and beyond. These hacks have worked well for us at Wyzowl and I know they’ll work well for you too. This post was brought to you by publi.sh Growth Day, which takes place on 12th July 2017. This free online event gives attendees direct access to marketing experts, and features a day-long schedule that’s jam-packed with insightful webinars and interviews. Its flexible format means that attendees can join events live, and catch the rest on-demand any time. Sign up now at https://www.publi.sh/growth-day/. Guest Author: Samantha Ferguson is a copywriter at Wyzowl, one of the world’s leading creators of animated explainer videos.